This is another favorite in our family. Well, my husband doesn’t like it. And neither does my middle son. But the rest of us like it. It’s a cinch to make and a great dish for a busy night. Which is what we had the night I made this so it worked out great all the way around. The first time I had Shepherd’s Pie it was when my husband and I were dating. There was an Irish Pub in the next town over from where I grew up that my husband and I visited often. On one of our frequent visits I saw Shepherd’s Pie on the menu and decided to try it. I fell in love with it instantly. Their serving of it was much prettier than the version I make but much of that has to do with the fact that each serving was served in individual pie dishes, and the whipped potatoes were beautifully swirled on top. A few years ago I was craving this dish. Hubby and I headed out for a date night without the kids, pulled up out front and found the Irish Pub we loved to visit while dating was now a biker bar/pool hall. I wasn’t a happy camper. And that is further evidence of how much I hate change! If you live relatively close to a Stew Leonard’s try their made in store Shepherd’s Pie. It’s delicious! Here is my simple version of this dish. I like to make this sometimes when I have some leftover mashed potatoes I want to use up. Makes it even quicker to throw together! Bring a pot of salted water to boil for your potatoes. If you have mashed potatoes leftover you can skip this part and just make the rest of the filling. If not, wash and peel all the potatoes and cut into even sized chunks. Pour into the boiling water and cook until tender. Drain and beat together with some butter, milk, salt and pepper and place to the side. I’m not giving measurements on this because it’s simple enough to just add enough of each ingredient to get that mashed potato texture. In a large skillet, brown the ground beef. Once browned well, drain and return to the skillet. To the ground meat add the packet of gravy mix, the diced onion, 3/4 cup of water, garlic powder, salt and pepper, and the frozen mixed vegetables. Mix together well until heated through. Pour the ground meat mixture into a 13″ x 9″ casserole dish and spread it out evenly. Then top the ground beef with the mashed potatoes and spread out evenly across the top. Place the casserole into a preheated 350 degree oven, and bake for 30 to 35 minutes, or until the bottom is bubbly and the top has browned slightly. You don’t want a deep browning on the potatoes, just a little golden will do ya! 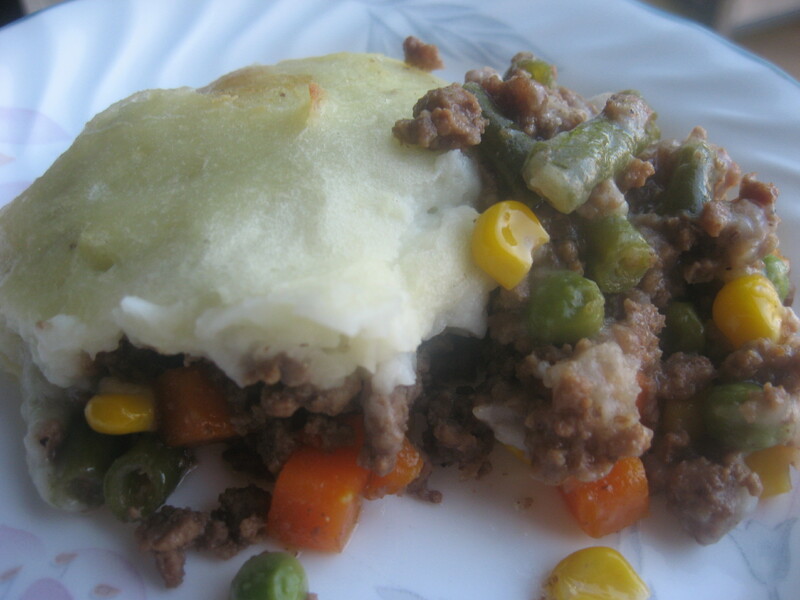 My twin toddlers love shephards pie…It is traditionally made with lamb but I have not given them the lamb version yet… I love how you added corn to this…. I love the corn in it, and so do my kids. Yup, traditionally it’s made with lamb, but other than the occassional lamb chop I’ve ingested every now and again, we are not lamb eaters. This is a super easy recipe.